기능별 솔루션이 있습니다. 아래의 내용 참고 바랍니다. A software that compiles more than 100 statistical features: data mining, machine learning, tests, data modeling and visualization. Since 1993, we have worked continuously to bring you and some other 50,000 customers from more than 100 countries a powerful, versatile, and above all user-friendly and affordable software to meet all of your statistical needs. 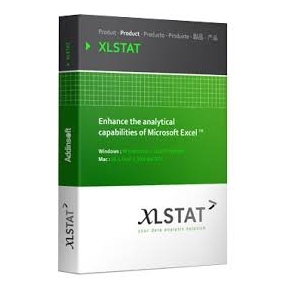 Featuring over 200 standard and advanced statistical tools, XLSTAT works as a seamless add-on to MS Excel®, allowing you to easily analyze and reformat your data within Excel. XLSTAT is compatible with both PC and Mac. XLSTAT uses pioneering computing techniques so that you get actionable results at unbeatable speeds: parallel computing allows you to take full advantage of all your computer processors. Today XLSTAT offers a wide variety of industry/field specific solutions designed for each and every one of you. So make way for a statistical software that will change the way you work. XLSTAT-Base is a competitively-priced starter solution that includes over 100 essential statistical tools that will allow you to gain deep insight into your data. Each of the XLSTAT-Base features is also available in the other XLSTAT solutions. You’ll benefit from data preparation and visualization tools, parametric and nonparametric tests, modeling methods (ANOVA, regression, generalized linear models, mixed models, nonlinear models), data mining features (principal component analysis, correspondence analysis…) and clustering methods (Agglomerative Hierarchical Clustering, K-means…). In addition, XLSTAT-Base features machine learning methods (association rules, regression and classification trees and K-Nearest Neighbors), partial least square regression and much more.